Amazon’s 2015 Fire TV isn’t so much a brand-new product as it is a touch-up on the original. The new Fire TV has a faster processor and supports the latest 802.11ac Wi-Fi standard, and it now streams Amazon and Netflix videos in 4K Ultra HD. The optical audio output is gone, but there's now a MicroSD card slot for storing more apps and games. The new Fire TV is otherwise the same as the original from 2014, with the same price, size, remote control, and software features. That’s probably why Amazon has replaced the old model with the new one, rather than selling both. It allows a simpler decision for anyone who wants a media streamer that puts Amazon content front-and-center: Don’t want to deal with the slower and cheaper Fire TV Stick? The Fire TV is the box to get. The new Fire TV replaces optical audio output with a MicroSD card slot. Processor power was never a problem with the original Fire TV, so for streaming purposes, the new chip mainly serves to support 4K Ultra HD playback. Provided you have a 4K TV with an HDCP 2.2-enabled HDMI port, along with a fast Internet connection (Amazon recommends 15Mbps), you can stream Ultra HD content from either Amazon Video or Netflix. The Fire TV even labels Ultra HD content from Amazon video on the home screen, so you can quickly jump in. Compared to other 4K streamers, such as the Roku 4, the Fire TV’s catalog is as basic as it gets. You can’t stream YouTube in 4K, nor can you watch 4K videos on networked storage devices via Plex. Services that support 4K rentals, such as Vudu and M-Go, aren’t available, either, which means you’re stuck buying Ultra HD videos at full price from Amazon’s a la carte store. Granted, the benefits of 4K are more hype than substance in my experience. On my 70-inch Vizio 2015 M-Series television, I’ve struggled to convince myself that Ultra HD creates a noticeable difference compared to a 1080p HD signal. The Fire TV’s saving grace, then, is that 4K is a standard feature, not something that requires a more-expensive version of the hardware. At this point, Fire TV still isn’t accommodating to people who lack Amazon Prime subscriptions. So much of the Fire TV’s home screen, menu sections, and search are dedicated to Amazon video that you’ll feel like an uninvited guest for not paying the $99 annual cover charge. Given that the entire Fire TV business model hinges on you buying more stuff from Amazon, it’s unlikely that this situation will change. And yet, there’s almost a method to this madness. Amazon doesn’t want you to think too hard about what to watch. Instead, it wants you to thumb around a bit until a pleasant piece of poster art floats by, and you click it. You’ll probably neglect some other apps at the expense of what Prime has to offer, but that’s the point. I’m oversimplifying a bit, as the Fire TV does make some meager attempts to bring other video sources into its menu system. My “Your Shows” section, for instance, included a strip of video recommendations from Crackle, though none of my other installed apps provided the same courtesy. The home screen also includes some recommendations from apps like Netflix and Starz, but the integration is weak; clicking just dumps you into the main menu of that respective app. While Fire TV has the makings of more than just a vessel for Amazon video, it hasn’t put all the necessary pieces together. Crackle brings some videos directly to the Fire TV home screen, but they’re buried under a dozen Prime video teasers. At launch last year, the latest Fire TV introduced one new software trick, though it has since trickled to the original model as well: Users can now tap into Alexa, the cloud-based virtual assistant introduced with the Amazon Echo, for smart home controls, pizza delivery, music playback, and all kinds of Internet-based queries. To set up Alexa, you install a companion app on your phone, then use it to decide which Internet services Amazon can access on your behalf. Alexa aside, the Fire TV’s voice search hasn’t changed much over the past couple years. By speaking into the remote’s microphone, you can look up genres, actors, titles, and characters, and the Fire TV spits back apps and content that it thinks are relevant. The voice recognition works well, and includes some helpful integrations with certain apps, such as HBO Go and Crackle. On the downside, Netflix videos never appear in the search results, and the full list of services for a given movie or show is needlessly hidden behind a “More Ways to Watch” menu button. Fire TV search picks a preferred streaming source and makes others hard to find. 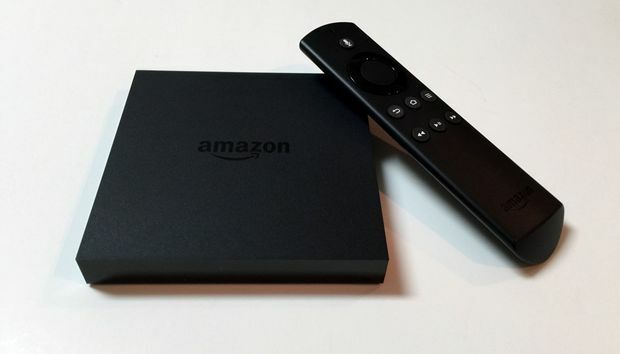 Like its predecessor, the new Fire TV is not everyone’s ideal media streamer. It remains a non-starter for people without Prime memberships, and the 4K content selection doesn’t come close what's available on the Roku 4. Instead of trying to suit all interests, the Fire TV continues Amazon’s pursuit of the perfect Prime-video-delivery system, bolstered however slightly by Ultra HD resolution and faster Wi-Fi. You already pay $99 every year for Prime; what’s another $99 to make the most of it?